Cyber Knights - Did you find The Wheel? Did you find The Wheel? From feedback on the forum, its clear that a lot of people have not found The Wheel on their own. 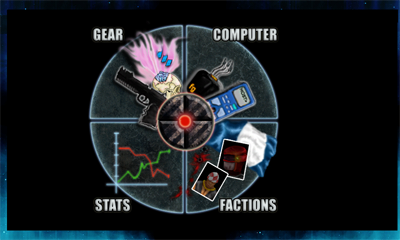 Its available from any of the Team Status pages (Stats, Gear, Computer, or Factions) by simply touching your current character's portrait. It makes it easy and fast to navigate the different Team Status pages. Thanks for the feedback from all the great Cyber Knights players out there and our team of BETA testers on the forum! We are getting some great suggestions on how to make The Wheel more obvious, but in the mean time we wanted to point it out to everyone!